In 1872, Walter Scott sold food out of a horse-pulled wagon to employees of the Providence Journal in Providence, RI, effectively introducing the diner. Since then, quintessentially American diners, with their distinct exteriors and casual atmosphere, have been offering patrons a wide range of food at affordable prices. Although many diners have been replaced by fast-food chains, many have remained and are beloved institutions in their communities. Campus Corner is no exception. Situated in a beautiful locale in the oldest part of Plattsburgh, Campus Corner has been beckoning residents, students, and tourists alike with its nostalgic neon sign and soul-enriching comfort food since Henry Ratta began welcoming diners in 1950. At 92 Bridge Street, Campus Corner sits downtown across from the train station and within walking distance of both SUNY Plattsburgh and the Plattsburgh City Marina. 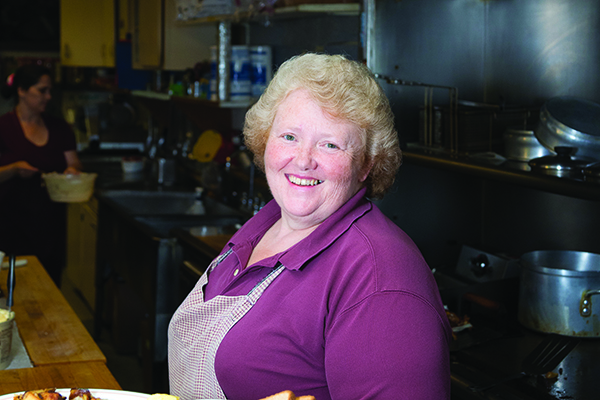 Current owner Sue Upton continues the diner’s tradition with her culinary skills and care for the community. Upon entering the diner, customers are immediately greeted and encouraged to choose a vintage bar stool at the M-shaped counter. A sign on the wall saying, “Welcome to Susan’s Kitchen” sets the tone. “I have enjoyed cooking since I was a kid,” said Upton. “I grew up in Beekmantown with a mom who raised five children as a single parent. We grew and canned our own vegetables, and learned early how to be self sufficient.” Attending BOCES (now CV-TEC) while in high school, Upton honed her culinary skills, and upon graduation began working at Meadowbrook Nursing Home. There she learned how cook meals that nourished the seniors she both fed and befriended. Continuing her career at Evergreen Nursing Home, she became proficient in her art—perfecting recipes and expanding her outreach. Over the years, Upton not only worked at nursing homes, but also gained experience at area restaurants such as Anthony’s and Dominic’s. In 2004, Upton and her friend Kathy Nephew found out Campus Corner was up for sale and decided to embark on their own journey as business owners. They purchased the business, leasing the space it had occupied for decades, and eagerly opened the doors and waited for customers. Open for breakfast and lunch Monday through Saturday, Upton begins serving at 6 a.m. No stranger to hard work, she handles every aspect of the business. There is food to be ordered, prepped, and prepared; employees to hire, train, and supervise; dishes to wash; a facility to clean, decorate, and maintain; bookkeeping; decorating for each holiday; menu planning; and, most importantly, customers to greet and socialize with. She manages to take Tuesdays off. Campus Corner’s extensive menu offers a full range of breakfast dishes—from eggs every style to pancakes, waffles, omelets, and breakfast sandwiches. Lunch consists of burgers, hot sandwiches, poutine, Michigans, fried fish, soups, wraps, and salads. So customers can have maximum options, the diner’s menu offers an extensive list of side dishes for both breakfast and lunch. Upton posts daily specials on a signboard, and on Campus Corner’s Facebook page. She refreshes the entire menu every two years. “I recently updated the omelets; they’re a big thing. Customers can build their own, and on Thursdays they’re $1 off,” said Upton. Always looking for the personal touch, Upton brings fresh vegetables, in season, from the family garden. Like many restaurants, Campus Corner has a core group of regulars augmented by clientele who change with the season. In the summer, boaters stroll up from the two nearby marinas and have the option of eating outdoors under three awning-covered booths. In the fall, college students arrive. In the winter, local customers provide a steady demand for deliveries. The diner’s regulars include local families and seniors who come every day. In addition to getting their meals just the way they like them, the regulars are welcome to linger and talk. “I would love to open a restaurant just for seniors. I enjoy them so much,” said Upton. “We have one customer who drives here, but who has trouble parallel parking. She just beeps the horn, and we go out and park the car for her.” Upton’s care for her older customers is evident in the portraits she has hanging on the walls. Some are of special customers who have passed on. Upton displays their portraits to showing they are still cared for and present. Upton’s embrace and support of college students is just as strong, as evidenced by the sign out front that reads, “Campus Corner accepts Cardinal Points,” and photos of a jubilant hockey team showing off its championship trophy inside. In fact, the SUNY Plattsburgh women’s hockey team attributes its multi-year winning streak to eating at Campus Corner before each game. “I support the college quite a bit,” said Upton. “They’re all good kids. It’s a good thing to have fun with them. And some of them sure can eat. They love the Lumberjack breakfast.” Upton attends games, especially hockey and baseball, whenever possible. With a philosophy of not asking any employee to do anything she wouldn’t do herself, it isn’t surprising that Upton runs an efficient and congenial staff. Her cooks, Windy Holmes and Sherry Reiblein, have been managing the grill since 2007 and 2015, respectively. Upton’s other seven employees are college students. She pays special attention to them. With specials like beef stroganoff, beer-battered haddock, goulash, and steak sandwiches; and with brownies and strawberry cream roll for dessert, who wouldn’t agree that eating at Campus Corner is like eating at home?